What is the Difference between Commercial and Fine Art? By definition, all art is the expression of emotion and imagination. It begins with a concept or idea and blooms in the artist's hands. There is no difference between commercial art and fine art in this respect – both come about in the same way. The difference lies in why the artist is creating it. You would not expect to see commercial art in a museum. It's created to sell something, typically a product. Fine art’s purpose is to create an aesthetic object that's appreciated for its fine and unique qualities. Fine art's purpose is simply to exist and thereby offer enjoyment to others. It doesn't compel the viewer to go out and do something or purchase something. Fine art is respected and critically acclaimed. Commercial art might be appreciated and acknowledged, but it's not going to hang in the Louvre. Commercial art tends to utilize acquired skill, whereas fine art requires inborn talent. Commercial art includes advertising, graphic design, branding, logos and book illustrations. Fine art includes paintings, sculptures, printmaking, photography, installation, multi-media, sound art, and performance. The difference between commercial art and fine art was pretty clear up until the mid-20th century. Commercial art included television and print advertisement campaigns, as well as mass-produced images. 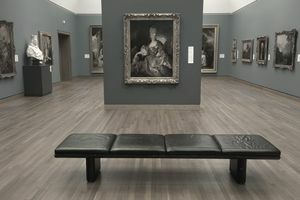 Fine art consisted of one-of-a-kind unique objects such as paintings, sculptures and works on paper that were exhibited in galleries and museums. Then the art movement known as pop art subverted and merged those diverse aims in the 1960s. Pop artists such as Andy Warhol mass-produced images using the tools of a commercial artist. Warhol's silk-screened Brillo Boxes is a memorable example of how commercial art merged with fine art. Danto realized that art such as Warhol's Brillo Boxes was much more than just an object to be visually perceived. It needed a system to define it as art. ''It is the role of artistic theories, these days as always, to make the art world, and art, possible," he wrote in his famous essay, "The Artworld." In other words, it is the art system of galleries, curators, art critics and artists which help define what is fine art and to differentiate it from commercial art. Artists often use commercial techniques in today's contemporary art scene. A prime example is video artist Pipilotti Rist, whose videos resemble music videos. Her work is nonetheless exhibited in art galleries and museums. Even though today's art world combines elements of both commercial and fine art, art schools still maintain a division between the two. Students must choose between majoring in fine arts or commercial graphic arts when pursuing degrees.